Preservation of Community Assets: Is This The Way To Make America Great? Patent application for "the multiple telegraph"
Welcome to the new week and newish subject to chat about. Today we are going back to the topic of immigration. In this case, how immigration impacts innovation. Some our greatest innovators have been, at one point, immigrants, like Scottish-born Alexander Graham Bell, the inventor of the telephone. Now imagine, an modern day Alexander Graham Bell, trying to enter the United States following President Donald Trump's executive orders and promised crack down on immigration. You could argue that "he is from Scotland and therefore, not subject to immigration restrictions." However, if POTUS manages to get his immigration legislation passed and signed into law, it is possible that even a Scottish-born, highly skilled immigrant like Alexander Graham Bell could be shut out of the United States. How can this be possible? Read on. Tanvi Misra points out in her CityLab article, " How Immigrants Changed the Geography of Innovation," "...his immigration and refugee ban, leaked draft orders, and the language of his top aides all suggest that he's looking to go further, restricting the legal immigration of 'high-skilled' workers." Thus, an immigrant Alexander Graham Bell would not be able to enter the United States, regardless if he or she is able make a positive contribution to the nation. Even more potentially damaging is a possible restriction of highly skilled immigrants would compromise America's ability to innovate, limiting the country's technological advantage and economic growth. History offer some support for the above argument. A new working paper by University of Chicago economists Ufuk Akcigit and John Grigsby with Harvard economist Tom Nicholas, The Rise of American Ingenuity: Innovation and Inventors of the Golden Age (http://www.nber.org; date accessed Mar. 27, 2017), looks at the role that immigrants play in innovation. 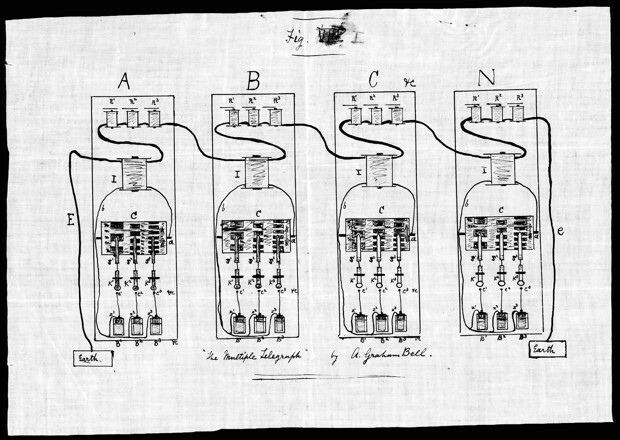 By matching U.S. patent information to local Census numbers between 1880 and 1940-which they refer to as the "golden age of innovation-" the co-authors were able to quantify the major contributions immigrants to American technological progress. The macro-view is "...immigrants fueled regional inventiveness, bolstered creative momentum within their industries, and drove long-tern technological growth." 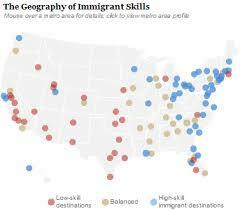 "The Geography of Immigrant Skills"
You've got these anecdotes like Alexander Graham Bell that give you an image of what immigrant inventors were like, but hopefully, the beauty of this paper is that we're going way beyond those anecdotes. Tanvi Misra writes, "The paper first illuminates how immigrants influence the geography of inventiveness." For example, states like New York andI Illinois had the highest per capita patents during the study period, "around 20 percent of the population was foreign-born." 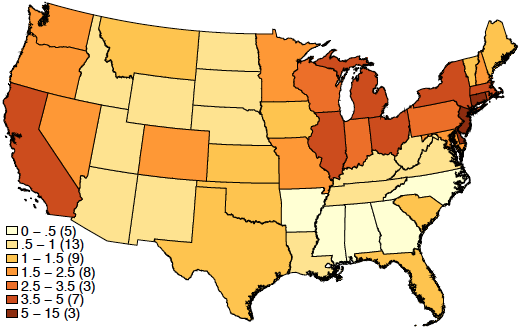 In states with the least per capita patents, immigrants make up "2 percent of the population." This statistic is particularly significant because regions and technology hubs with higher patents experience more economic growth, according to a previous analysis by the co-authors. There are two reasons for this phenomena. Prof. Nicholas continued, One explanation is that immigrant inventors concentrate in...Independently, they fill gaps in knowledge. In essence, immigrants with great ideas tend to congregate in places and occupations where their ideas are welcome. Further, "when many of them work together, they influence each, compounding the ingenuity in their own field and others," according to Prof. Nicholas. Independently, they fill gaps in knowledge. ...perhaps because such places were less likely to be open to disruptive ideas and intolerant of social change. Thus, it is no big surprise that cities with the greatest number of patents: San Jose, Houston, New York, Chicago have a greater share of immigrants populations. Prof. Nicholas and colleagues also concluded that "...immigrants made up a higher share of the inventor population (around 20 percent) than the non-inventor population between 1880 and 1940." Europeans were the dominant demographic group, which is logical given the tight restrictions on Asian and Middle Eastern immigrants at the time. Tanvi Misra notes, "Around 30 percent of today's inventors are immigrants hailing from India and China." 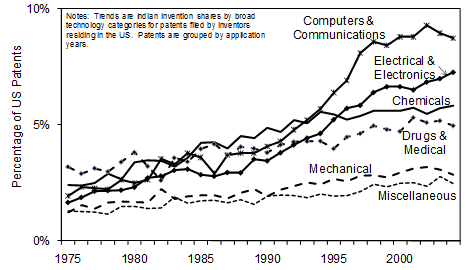 Further, on average, immigrant inventors were more productive, "with 9 percent more patents through their careers than their native-born counterparts." 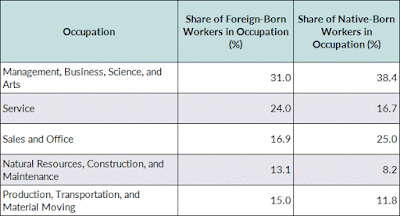 Despite the higher level of productivity, immigrant inventors were "paid 5 percent less." Ms. Misra concludes, "The mismatch between wages and relative productivity suggests labor market discrimination." Fair conclusion. The irony in all this is President Trump campaigned on the promise of "Make America Great Again," is doing precisely the opposite. Then-candidate Trump based his campaign on economic anxiety, promising to return the United States to a high level of competitiveness, yet wants to severely limit immigration. The Rise of American Ingenuity: Innovation and Inventors of the Golden Age (http://www.nber.org) by University of Chicago economists Ufuk Akcigit and John Grigsby with Harvard economist Tom Nicholas bolsters the case that tech companies, like Apple and Microsoft, are making against a legislative agenda that potentially threatens the future of American innovation. Ms. Misra speculates, "With fewer immigrants, Silicon Valley may no longer be able to maintain its primacy as a global tech hub." Should the unthinkable happen and legal immigration is severely restricted, the more welcoming Vancouver, Canada will be in optimal place to open up to global talent.